As a geologist, Susan Morrice is passionate about science. She has been lucky enough to travel all over the world searching for energy, changing lives and encouraging those around her. Her passion for her profession led her to establishing Belize Natural Energy as well as her other ventures. She wants to help spread her love of the sciences in any way she can, so Susan loves talking to kids about different geological subjects as well as earth and physical science topics. She hopes to reach young school children who are currently learning about the discipline and become a resource for them by encouraging them to pursue their dreams. In addition, she has the desire to become a beacon to these kids who may be looking for an example of someone who has lived and breathed geology and turned it into a successful profession. In her workshops and lectures, Susan covers the broadest range of geology and exploration topics using her great story telling and delivery skills to really engage the students. If you would like Susan to come along and talk to your group, please ask your teacher to email Susan today at susan@susanmorrice.com. To younger students, Susan likes to read from a children’s book written about her discovery of oil in Belize. 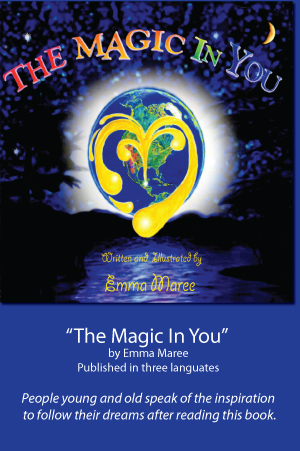 This book was written by Emma Maree and is called “The Magic in You”.